Sprague Union Terrace, a mixed-use development at 1420 E. Sprague Ave, provides 37 rental homes for people in the work force, as well as retail stores on the ground floor. "It started with an address, keys, bed, stove, refrigerator, microwave and shower – a place for a stuff – and a place to call home. Now we are building a neighborhood. We've picked up trash, planted a garden, and even had a visit from our senator." 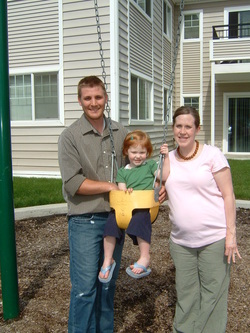 Spokane Housing Ventures' 36-unit Village Apartments, located in Spokane Valley, offers a large play area for families.